How can cities manage rapid growth while balancing concerns over environmental risks and maintaining the community’s character? The City of Hammond has undergone major changes in the aftermath of Hurricane Katrina and subsequent storms over the past 8 years. The city has experienced major flooding and wind damage. However, the response to the storms has extended far beyond restoring power and raising, retrofitting, or rebuilding damaged structures. Hammond experienced a population increase of 30% percent following Hurricane Katrina, as residents, businesses, and military operations relocated from coastal communities in response to the associated risks with having a base of operations in vulnerable areas. Hammond’s accessibility, as it is conveniently located at the intersection of Interstates 55 and 12 in Tangipahoa Parish, paired with locally available and inexpensive land, made it a desirable destination for relocation. Although Tangipahoa Parish does touch on the northwestern shore of Lake Ponchartrain, Hammond is located further inland, and does not encounter the threat of storm surge facing lake-front communities. The explosion of growth, rapid development pressures, and the promise of rapid economic expansion compelled the city to develop a plan to play a proactive role in shaping the future of its community. Furthermore, despite the reprieve of storm surge in Hammond, the city nevertheless faces major environmental risks, predominantly due to flooding. Downtown Hammond. Photo via Southeastern Louisiana University. In June 2011, Hammond adopted the Hammond Comprehensive Master Plan, which established a collective vision and set of policies to direct future development in the city. The plan balances quality of life concerns and economic opportunities, while promoting sustainable and responsible land use and development decisions. To help ensure the realization of the goals laid out in the Comprehensive Master Plan, the City of Hammond has developed a new Unified Development Code (UDC). This comprehensive zoning ordinance not only codifies the intentions of the master plan, it combines the city’s different regulatory statutes into one cohesive document. Furthermore, in preparing the UDC, the consultants conducted a rigorous set of audits of the Comprehensive Master Plan, to ensure that the regulations spelled out in the code respond accurately and appropriately to the desires of the master plan, and to highlight items requiring further action. The City of Hammond’s new Unified Development Code will help promote local resilience by providing a clear set of land use and development rules and regulations for achieving the community’s goals, as well as clarifying potentially conflicting provisions from multiple ordinances. In light of ongoing and expected rapid growth, the Hammond UDC integrates multiple regulations to mitigate the potential for new development to increase flood risks and subsequent impacts on the community. These broader impacts are recognized to include costs of recovery, infrastructure, and business down-time, thus elevating the concern, and need for action, beyond on-site flood risks. The Hammond UDC address environmental factors through specific requirements related to drainage. Overall, the overriding concept is that any new development should not adversely impact or change natural drainage patterns, and a Drainage Study is required for many permits. Any new construction or modification must demonstrate that it will not make any changes to the flow of water through the property, including the location and amount of water that enters and exits the property. Flood information that determines regulatory standards and that is provided in the permit review process, must include not only FEMA designated floodways and floodplains, but also record flood extents and levels. In some cases, the greater of these determines on-site regulations. Stormwater management proposals are encouraged to maximize efficient use of natural drainage systems. Any proposed development on land abutting any drainage canal must be reviewed not only by the City Engineer but also by the Drainage District. Permit requirements for any grading work must include significant information relating to impacts to runoff and flooding, including limits of floodplain, existing and proposed drainage structures or features, soils, topography, erosion and siltation control plans, and drainage calculations. Stormwater runoff from a site must not cause detrimental impacts not only in the quantity of runoff, but also in the quality of the water, to avoid pollution of watercourses with nutrients, sediments, or other earthen material generated on or caused by surface runoff on or across the permit area. Planned developments have specific open space requirements, including 50% greenways and a minimum of 1 acre of dry detention basins or retention areas. The Hammond UDC promotes resilience through consideration for economic development and community character – and how these priorities are undermined by flood risks. In addition, the UDC provides clear information and expectations for residents and potential development. This creates a positive climate for investment in a community, through a straightforward, clearly described permitting process and relevant information. The UDC recognizes and promotes flood protection and mitigation for the goals of minimizing prolonged business interruptions, minimizing future flood blight areas, and minimizing the need for rescue and relief efforts associated with flooding and generally undertaken at the expense of the general public. The UDC requires that potential buyers be notified if a property is in a flood area. 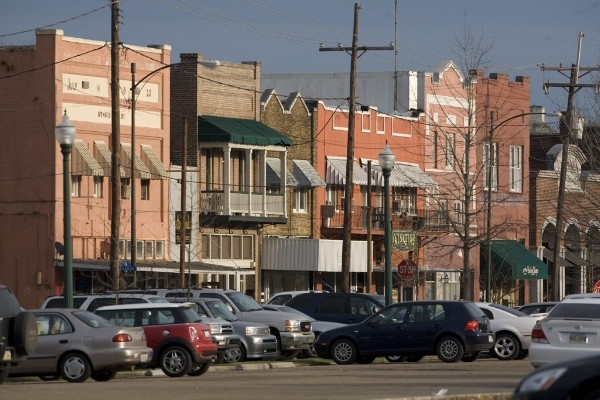 The Hammond Historic District considers community character concerns when fostering economic development. The UDC lays out a clear review authority and includes a system for managing disputes or resolving conflicts. The Hammond UDC will foster the community’s resilience by ensuring that all infrastructure is constructed to meet the highest standards – both technically and in line with state and parish regulations – as well as to promote the community’s character. The thorough and technical requirements laid out in the code clarify required specifications, without being overly restrictive or limiting innovative solutions. Roads must incorporate local flood risks. The minimum road grade for local streets should be greater than 1 foot above the 50-year flood elevation or record inundation elevation. Large flood control infrastructure projects are discouraged, if other measures can be used to mitigate risk, in the interest of minimizing expenditure of public money on costly infrastructure. Reductions in required parking are available based on specific uses, factors, and criteria. This ensures an efficient provision of infrastructure and encourages investment in areas with favorable conditions, such as access to public transit, mixed-use developments, or alternative transportation infrastructure. Furthermore, it limits stormwater runoff. Landscape requirements can be met through a variety of interventions. Each measure equates to a predetermined number of points, and a set number has to be met to fulfill the requirement. This ensures the main goals are met, while allowing for innovative, alternative, or more economically viable options. Street-section details in the Appendix provide clarity regarding street and community infrastructure requirements. Road construction or improvements require a series of studies, including an impact study, trip generation modeling, and a soil boring report to determine appropriate materials for paving. The extensive, multi-part audit has highlighted additional items to be addressed. Furthermore, the approach of conducting such a thorough audit sets a good precedent for the city to evaluate needs and actions moving forward.